WorkAbility I is a nationally recognized school-to-work program that provides comprehensive pre-employment training, employment placement, and follow-up for students in special education who are making the transition from school to work. It is funded by a grant from the California Department of Education Special Education Department. WorkAbility I helps students develop positive interpersonal skills, marketable job skills, and provides opportunities for paid work experience, limited term on-the-job support, and guidance from WorkAbility personnel. Students 14-22 years of age with an active IEP (Individual Education Plan) are eligible for WorkAbility I services. 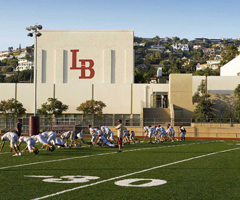 The Transition Partnership Program (TPP) is a cooperative agreement between the Laguna Beach Unified School District and the California Department of Rehabilitation. The program assists LBHS students with their transition from school to work. Support through the TPP can be provided in the areas of vocational assessment, employment readiness training, job skills training, employment subsidization (up to 100 hours), job coaching, post-employment support and post-graduation support. To qualify for TPP services, students must be in their junior or senior year at LBHS and have an active IEP. Ultimately, the goal of the TPP is to support students through a minimum of 90 days of gainful, unsubsidized employment. All students are placed in the workability program through the IEP process. For more information, contact Cyndi Kimball at ckimball@lbusd.org.